Monogram's 1/48 B-26 Marauder is still a very nice kit, despite being rather long in the tooth. It is also pretty accurate. That is, except for the engine nacelles. One can blame the mold make capabilities of the time on this. 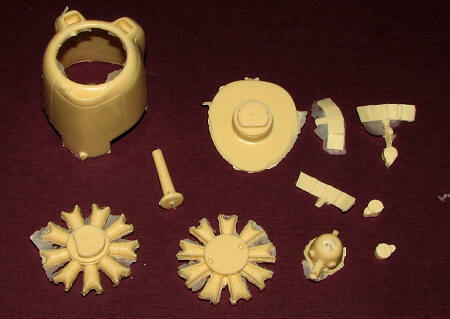 Now Loon Models as produced a replacement set of cowlings along with a full two piece engine, a fire wall, prop shaft, separate cowling flaps and separate distributors. There are a few more bits than this included in the set as well as an extra flap and distributor. You will notice that I am only showing one of the engine/cowling sets. You get two of them in each kit. The set includes full instructions and some background information. The resin is well formed though does need some cleanup prior to use. Simply remove the fine flash and smooth the edges. Thanks to Loon Models for the review sample. You can get these from www.rollmodels.com, some other fine on-line shops like www.greatmodels.com or your local retail hobby store. If they don't carry them, ask for them.